WhatsApp is used by millions of people worldwide. When it comes to WhatsApp, there are many Features Of WhatsApp and the one which is used more if WhatsApp Voice Call & Video Call. We can easily connect with our friends and family over the internet on WhatsApp. But, when it is exorbitant, we need to Disable Calls On WhatsApp for that person. So, here in this Article, I’m going to Share How To Disable WhatsApp Call On Android. We all love calling on WhatsApp as it is free of cost and reliable. Also, if we use normal calls, our calls can be recorded but with WhatsApp, there is no need to worry about Call Recording but, using some tricks you can also Record WhatsApp Calls. Still, Voice Call Feature of WhatsApp is more reliable and it is used by most of the WhatsApp users. If someone irritates you by continuously calling on WhatsApp you can simply block him/her from your contact but they will be able to know that you have blocked them on WhatsApp. So, the better way is to Disable WhatsApp Call for them. Officially, WhatsApp doesn’t have the feature to Disable Calls On WhatsApp for a particular person or for everyone. So, we thought to Share the method using which you can easily Block WhatsApp Call On Android. This method will help you in many situations like if you are busy with your work and your friend is irritating you by messaging and calling you, Simply Deactivate Whatsapp Call for him & they will won’t even know that you are not receiving their calls. Also, if you want, you can auto-reply to him like “You Are Busy” using WhatsApp Auto Reply. Though there are many Apps On Play Store & Play Store Alternative, here I’m going to Share about GB WhatsApp cause it has much features than you expect. 1 How To Disable WhatsApp Call On Android? 1.1 How To Disable WhatsApp Call For Specific Contact? 1.2 How To Disable WhatsApp Call For Every Contact? I’ve already shared many Articles On WhatsApp Tricks Like How To Read Deleted Message On WhatsApp, How To Create Fake WhatsApp Conversation, How To Send Blank Message On WhatsApp, WhatsApp Bomber, etc. you can check this out. So, let’s proceed further and check out How To Disable WhatsApp Call On Android? How To Disable WhatsApp Call On Android? As you have to Download GB WhatsApp in order to use this method, so you have to take backup of your WhatsApp Chat. Simply head over to your current WhatsApp Settings & Take a Backup of your WhatsApp Chat. After taking Backup, Simply uninstall your WhatsApp. 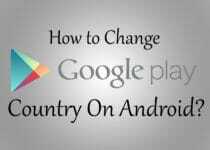 Now, Download GB WhatsApp from below link & Install the App. Simply Enter your Number & Verify it. Finally, Restore your WhatsApp Chats. How To Disable WhatsApp Call For Specific Contact? Step 1: Open the Contact Chat for whom you want to Disable Voice Call On WhatsApp. Step 2: Click on the Contact Name as shown below. Step 3: Now, Click On Custom Notifications > Check Use Custom Notifications & then Check Disable Voice Calls. Done! WhatsApp Voice Call is Disabled For Specific Contacts. How To Disable WhatsApp Call For Every Contact? Step 1: Click on three dots from top right corner & then click on GB Settings. Step 2: Scroll Down & Click On Other MODS. Step 3: Again, Scroll Down & Finally, Tick On Disable Voice Calls. Done! WhatsApp Voice Call is Disabled For Every Contact. This was the Article On How To Disable WhatsApp Call On Android. 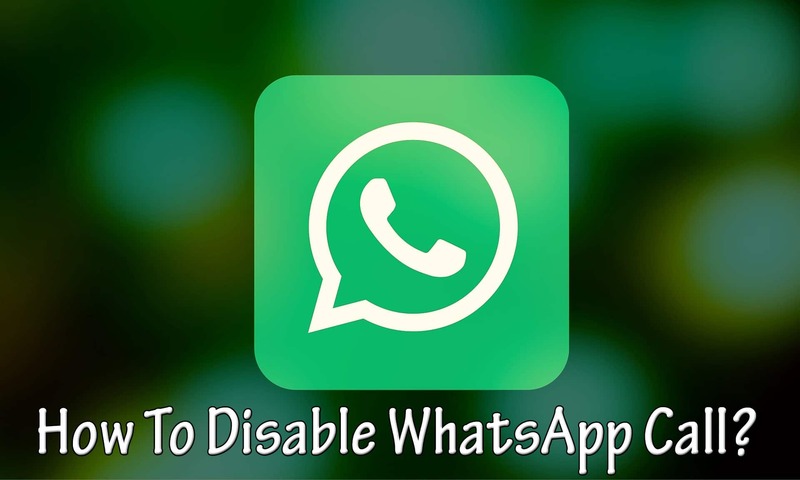 Though there are many Disable WhatsApp Call APK available on the internet, I’ll recommend you to go with GB WhatsApp as it also has many other cool features. 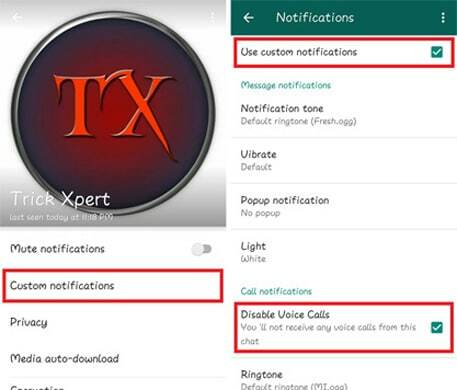 Using this Method, you can easily Disable Voice Calls On WhatsApp without letting anyone know. Hope you liked this Article On Disable WhatsApp Call. Do Comment below if you have any query. Stay tuned with us for more latest Tricks & Updates.